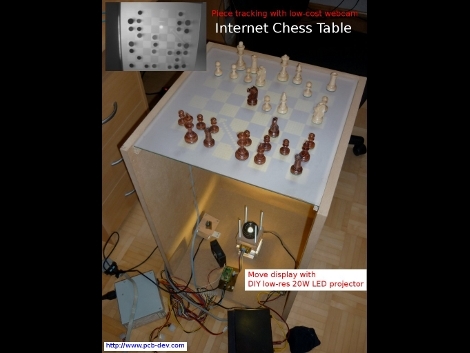 Wanting to get back to playing with actual pieces, [Thomas Pototschnig] built a chess table that interfaces with the Internet. The table uses an custom setup to project the board on the frosted surface of the table. Chess moves from your internet opponent are displayed as arrows on the board so you can move the pieces. Your moves are detected by a webcam below the surface as this table actually functions as a multitouch display. From the description, it sounds like the projector was made from a 128×64 graphic LCD display. 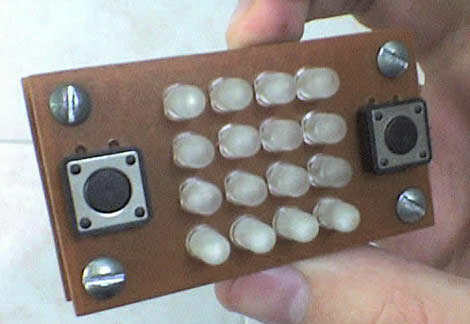 A 64×64 pixel area is used, with an LED below and a lens above. This works remarkably well. See for yourself after the break. Want some other options for your chess setup? You can play against a robot arm, or if you’ve got 144 square feet of extra space you can build a really big board for the occasional game. Adding speech recognition to your embedded platform. Last week, we posted a story about how to configure speech recognition at a beginner level. Several of the commenters expressed an interest in doing speech recognition for embedded devices. [Nickolay Shmyrev] volunteered to write some directions for those people. In this article, [Nickolay] will be taking you through the basics of setting up your embedded device with CMUsphinx an open source toolkit for speech recognition. He gives programming examples in both C and python. Though we are hosting this, we haven’t set it up and tried it, so please direct any questions you have at [Nickolay] in the comments.